Hash Auger is compatible with NiceHash and is a modern replacement for the NiceHash version 2 mining software. By replacing the standard NiceHash client software with Hash Auger, Nvidia GPU Miners can enjoy the performance benefits of the latest miners along with advanced features such as profit-based switching, algorithm-specific overclock profiles, minimum earning limits and more. Hash Auger can also use the 1.4.4 version of NiceHash's Excavator mining program if users download and install it manually. 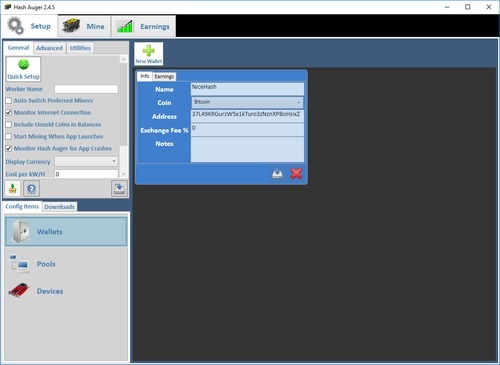 Hash Auger allows users to define multiple wallets for each coin they would like to mine. It should be noted that adding a wallet in Hash Auger does not actually create a new wallet with any pool or exchange - instead it merely adds an existing wallet address to the software's config files. Since internal NiceHash wallets cannot be used with other auto-exchange pools, separate wallets must be created in Hash Auger for them. Users who would like to use an external Bitcoin wallet with NiceHash can skip this step if they have already added that wallet address to Hash Auger. Press the New Wallet button. In the Info tab of the new panel, enter a unique Name and your NiceHash wallet Address. If you would like your NiceHash revenue to be charted, switch to the wallet's Earnings tab and enable the Track Earnings? setting. Save the new NiceHash wallet. Once the user has defined a wallet with the address they would like to use, the next step is to enable NiceHash within Hash Auger. This is a straightforward task of providing some NiceHash-specific setup information and assigning the correct wallet address to the pool. All users - regardless of the type of wallet they are using - should follow these instructions. Select Pools in the Config menu. Expand the Nicehash panel using the arrow to the left of its title. If you do not see NiceHash in the list of pools, make sure that the Auto-Exchange button at the top of the list is currently pressed. On the panel's General tab, select the closest NiceHash server from the Region's list. 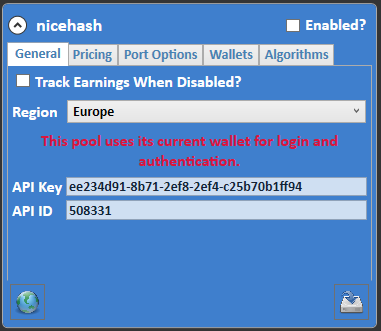 If you would like Hash Auger to display your current NiceHash balance, the API Key and API ID from your NiceHash account must be entered into the respective entry fields. Since Hash Auger does not use your API Key to make changes to your account, it is recommended that you provide the Read-Only version of the key. Assign your NiceHash wallet by switching to the Wallets tab. Checkmark your NiceHash wallet and verify it is selected in the Current drop-down list. 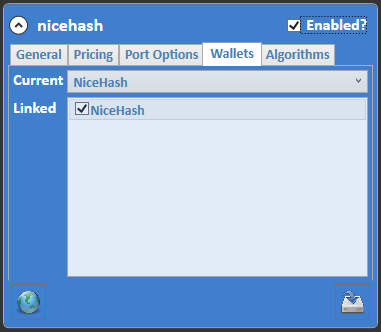 Enable NiceHash by checking the box in the type right corner of the panel. If you are setting up the software to switch between NiceHash and other pools, consider enabling the Subtract Exchange Fee? option for more accurate pricing. With this feature enabled, Hash Auger will automatically deduct wallet fees from NiceHash price estimates. The Average Recent Estimates option can be enabled to decrease fluctuations in NiceHash price data to help prevent switching due to brief spikes or dips in prices. Verify that the correct Wallet Type has been selected for the type of wallet that you are using with NiceHash. This is important for price accuracy if you have enabled the Subtract Exchange Fee? option since each wallet has its own unique fee. 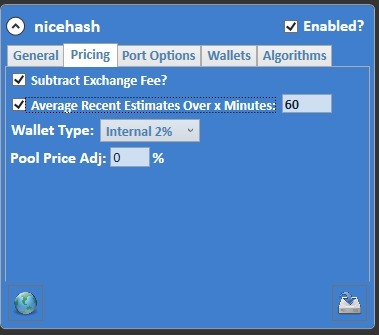 Finally, some users who use both NiceHash and other auto-exchange pools prefer to set a positive Pool Price Adj for NiceHash to reflect the higher consistency of its prices to actual earnings. Unlike other auto-exchange pools that exchange newly mined coins before distributing earnings, NiceHash pays a set price for hashing power. Users who prefer this type of earnings over others can add a positive price adjustment percent so that Hash Auger will choose NiceHash over other pools when estimates are similar. For example, a Pool Price Adj of 10% will cause the software to increase NiceHash estimates by ten percent, making it more likely that it will mine on NiceHash than other pools with similar price estimates. The Algorithms tab can be used to disable specific NiceHash algorithms for all GPUs. Commit the changes by clicking the Save button. If you have not benchmarked your GPUs and are finished enabling pools, go to the Devices Config item and press the Benchmark All button. In order to switch based on profit rather than revenue, users should verify that the Monitor GPUs option is enabled in the Advanced tab. If you would like to begin mining as soon as benchmarking has finished, verify that the Start Mining After Benchmarking? box is checked. Since HashAuger supports a number of different mining programs to get the best hash rates for your mining rig, the benchmarking process may take a little longer than what it did using the Nicehash software. However, it should be noted that all benchmarking is done live on NiceHash and other pools for greater accuracy and you will earn some revenue from the benchmarking process while making sure the software is selecting the optimal mining programs for your hardware. During Benchmarking, users can continue to setup the software by changing GPU specific settings, such as Minimum Earnings Amounts, Price Spike Limits and profit-based switching. Stop mining and exit Hash Auger. Create a folder called excavator within the Miners subdirectory of the directory that the Hash Auger .exe was installed to. (An example using the default install location would be \AppData\Local\CongeriesSoftware\HashAuger\Miners\excavator\ but yours would be different if you changed the install path). Extract the contents of the Excavator download to the new excavator folder you just created. Verify that excavator.exe is contained in a subdirectory of the \Miners\excavator directory. It is okay to have multiple subdirectories in that folder as long as the excavator.exe file is in one of them. The Excavator miner must be enabled and benchmarked before it can be used. Use the Benchmark Utility in the Devices Config menu to benchmark Excavator for all GPUs. If the software displays any error messages related to Excavator not being found or started, please verify that you are using Excavator 1.4.4a and that it has been installed to appropriate location.